The GCHP has been invited to display a segment of its Toronto Telegram exhibit from August 1 – 31 at Broadview Espresso – 817 Broadview Ave, Toronto, ON (Broadview Avenue just north of Danforth). The GCHP was invited by Mike Cullen, owner of the community café, and Laura Heaney, curator, to participate in the month long collaboration. The café’s walls are consistently decorated by the work of local artists and engage patrons while they enjoy Broadview Espresso’s coffee and snacks. The images selected for this exhibit were chosen to illustrate elements of public life of Greek Canadians in Toronto. Moments of family reunification, public protest, mass religious gatherings, and cultural celebration are documented through the lens of a documentary photographer – an outsider looking in. The images were also chosen because of their ability to highlight moments of the Greek immigrant past that have begun to fade from the city’s collective memory. 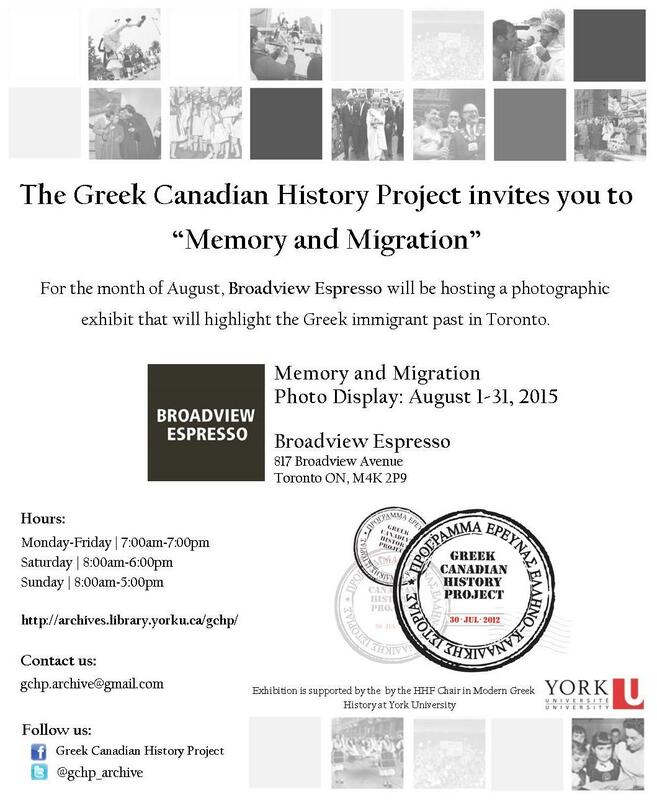 The photographic display (originally appearing at the Greek Community of Toronto’s March Independence Day Gala, 2014) was generously sponsored by the Liberal Arts & Professional Studies Department of History at York University. We thank the department and Dr. Marcel Martel, Chair of the Department of History, in particular, for the many acts of support of the GCHP and its public history initiative. This exhibition is also supported by the HHF Chair in Modern Greek History at York University. We would also like to thank our partners at Clara Thomas Archives & Special Collections of York University Libraries, particularly Michael Moir, University Archivist and Head, and Anna St. Onge, Archivist, Digital Projects and Outreach, who have invested in helping to bring this event and the broader mandate of the GCHP to fruition. We hope that you enjoy the installation!